Most of the golf courses and driving ranges in your area will have summer golf camps and some will offer as many as 8 or almost 1 every week during summer vacation. Get on the phone or the Internet and find out who is offering summer golf camps convenient to you. Tradionally, camp runs from 8:00am until 12:00noon, with snacks and refreshments furnished by the host. Friday is usually a “play” day where the kids play 9 holes on a nearby course. A PGA professional will be the lead instructor and will have other PGA pros or local high school or college golfers helping out. Expect to pay $150.00 or more for a quality 5-day experience. 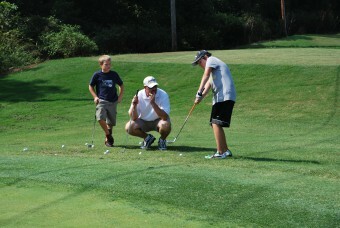 Another great source for golf camps is The First Tee. This is a nation-wide organization that does amazing work introducing kids to the game of golf. For example our First Tee here in San Antonio offers camp from 9:00am-4:00pm, Monday through Friday for $299.00. Go to The First Tee to find a location close to you. So now you can schedule a week of the summer and if you book a camp earlier in June or July, your kiddo will have a lot of vacation time left to work on what was learned at golf camp.